A general rule of thumb for container gardening is to use the biggest size container possible to grow. Back when I started gardening, I made the mistake of buying a bunch of 1 gallon nursery pots. However, I had to make use of them; I learned to grow smaller plants in these pots. Now the beauty of the 1 gallon pot is that the container can be improvised from old beverage containers, like water jugs. Anyone who can find an empty container, seeds, and soil can start growing vegetables. Plus the small size takes up little room in the garden. Here are a few of my favorite plants that you can successfully grow in 1 gallon containers. Traditional Italian dishes could not be authentic without some fresh basil. Basil is the perfect plant to grow as a chef. Fresh leaves can be continuously picked throughout the herb's lifecycle. It is very easy to propagate basil from both seed and cuttings. The plant can be kept for a while if flowers are constantly removed. Spinach is a very small plant that can fit well in nearly any gardening space. It's delicious leaves grow back quickly to allow for a continuous harvest during the colder months. From my experience, even though you can grow it in smaller containers (like 2 liter bottles), the plant is very prone to bolting (going to seed). The benchmark for all leafy greens, lettuce is the easiest vegetable to grow. It's small, compact size along with the ability to harvest individually leaves at a time makes it a perfect salad bowl plant to place in a small container window garden. Anyone can enjoy fresh salad with minimal effort. Swiss Chard is the best bang for your buck. This biennial constantly produces large leaves. You'll be able to harvest at the average of 1 giant leaf every week. In smaller containers, keep the soil moist to prevent the plant from "fanning out". Although it fits nicely in a small 1 gallon container, the plant will eventually get root bound. Despite this, the plant will still produce strong. Cilantro seeds can be scattered in a container. The plant does grow a tap root, but it isn't hard to enjoy small sprigs of cilantro in a favorite Mexican dish. With the plants as closely packed as they are, grab a pair of scissors and trim off what you need. It will grow back as quick as a lawn.The plant does not need to be big to have a big flavor impact in your cooking. The seeds can also be used in cooking once the plant goes to seed. Strawberries aren't a vegetable, but they make my list anyway for being one of the smallest fruits that is about to be grown in containers. The plant lives multiple years and can give several harvests, depending on the variety. Strawberry plant root systems do not take up too much space. With the plant in a container, it is easier to control the runners the plant sends out to propagate. Green Onions are small enough to be planted almost anywhere. Since the do not produce a large bulb, they fit snugly with small containers. Harvest them periodically for the onion greens, or wait until the bulbs are large enough and pull up the whole plant. Those are some of my favorite vegetables that can reach full size in a 1 gallon container. 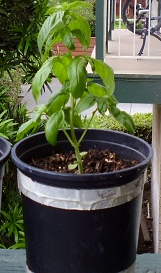 There are plants that can be grown in 1 gallon containers (tomatoes, peppers) before being transplanted to a larger pot, but that is another topic. Don't be discouraged if you do not have much space to grow. All the plants listed above can be grown in low light environments, making them perfect windowsill plants. What will you grow this year? Subscribe to receive more gardening hints and tips. Last summer I successfully grew broccoli and cauliflower in 1 gallon containers (upside down milk jugs with no lid). Every 4 weeks or so I'd slice the roots about 1 inch in from the sides. One large head per container! Thymes LOVE being potted! I've had one plant growing outside, in a 10" pot for 4 years (we're in NJ)... it absolutely thrives. With the right frames and cross shelving setups, you'll realize it's rather straightforward to coach your plants to grow vertically. There square measure ready-made vertical husbandry kits you'll get that may eliminate the guess-work in constructing your setup, but if you wish to you'll homemade route.